It was only a few weeks ago (at WWDC) that we had an update on the app store growth rates. The data was presented here. 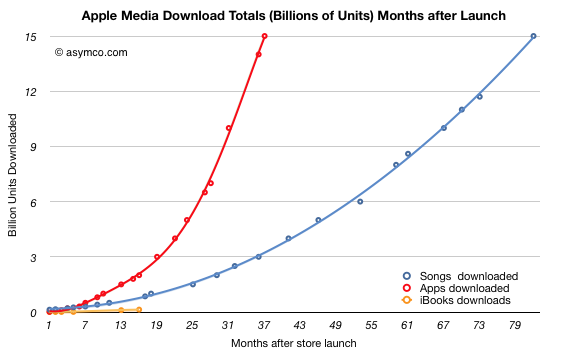 One of the data points from the event was that iTunes hit 15 billion song downloads. 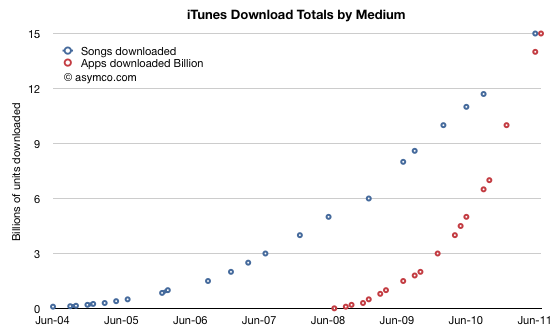 Last week we heard that iTunes also hit 15 billion app downloads. The milestones were reached within less than a month so it’s a fairly safe assumption that apps have overtaken songs. I had originally guessed that the cross-over would take place at 13 billion at the end of 2010. Download rates for songs had a minor rebound in the last six months. The app download rate is now at least 31 million per day while the song download rate is about 12 million per month. Including books (but excluding video content), the App Store in now delivering at least 44 million new content downloads per month. Song downloads increased unexpectedly. There was a rebound in the last six months where daily downloads went from about 8m/day to about 12m/day which is a new high. I had expected download rates to have peaked mid 2010. App download rates proved to be more volatile than expected. 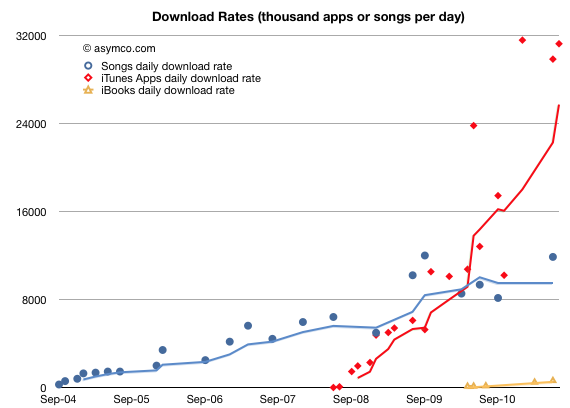 As the last chart above shows, the download rates fluctuate quite a bit. The 4-period trend line is a bit more stable, but there are kinks. Polynomial curve fitting is always sensitive. 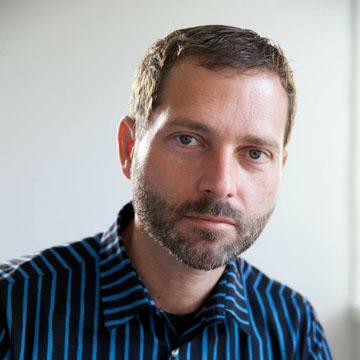 When dealing with polynomial growth, predictions can be very dangerous. Nevertheless, I think the overall performance of the App Store is phenomenal. › Next Post Is the tablet computer a new PC or post-PC?